This is the last in a series of blog posts outlining Pontoon development in 2014. I’ll mostly focus on new features targeting translators. If you’re more interested in developer oriented updates, please have a look at the release notes. In the past years, Pontoon has come a long way from an idea, a prototype, to a working product. 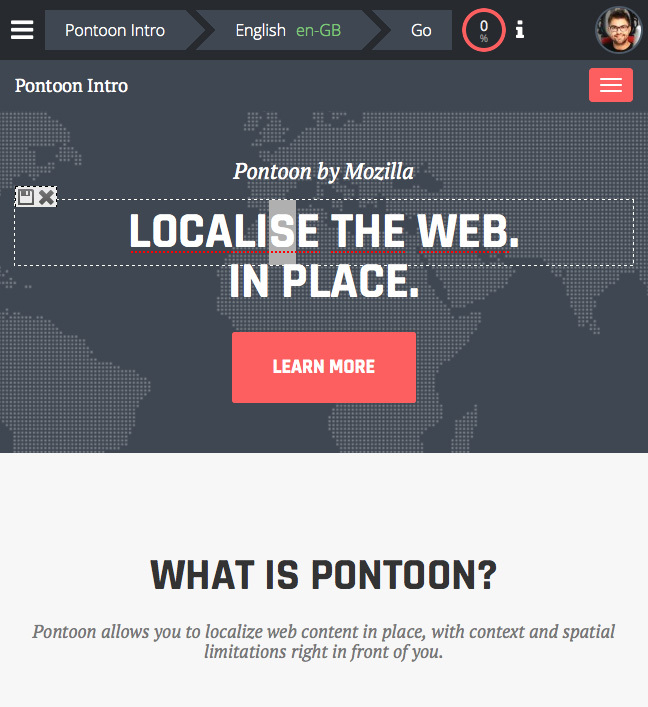 As of today, there’s a dozen of Mozilla projects available for localization in Pontoon. If you want to move it even further, there are plenty of ways to do so. Start learning how things work by looking at the new Pontoon homepage, which is also used as a demo project to be translated using Pontoon. Perhaps you can translate it to your mother language. You can also learn more advanced features. Making your website or web application localizable with Pontoon is quick and easy. A simple script needs to be added and you are halfway through. Follow implementation instructions for more details. Do you have ideas for improvement? Are you a developer? Learn how to get your hands dirty. It has never been easier to set up development environment and start contributing. We’re on GitHub. No comments yet. You should be kind and add one. By submitting a comment you grant Horv.at a perpetual license to reproduce your words and name/web site in attribution. Inappropriate and irrelevant comments will be removed at an admin’s discretion. Your email is used for verification purposes only, it will never be shared. Using a handcrafted Child Theme built on the Whiteboard Framework for Wordpress & Less Framework.